Where do you fall on the activewear vs loungewear debate? Which do you prefer to sew? To wear? 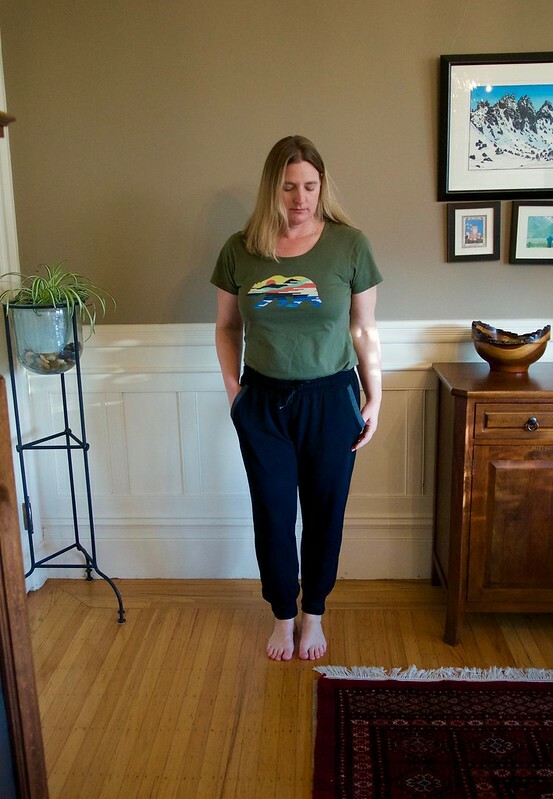 I made one of each – Sloan Leggings for exercising and Hudson Pants for lounging! 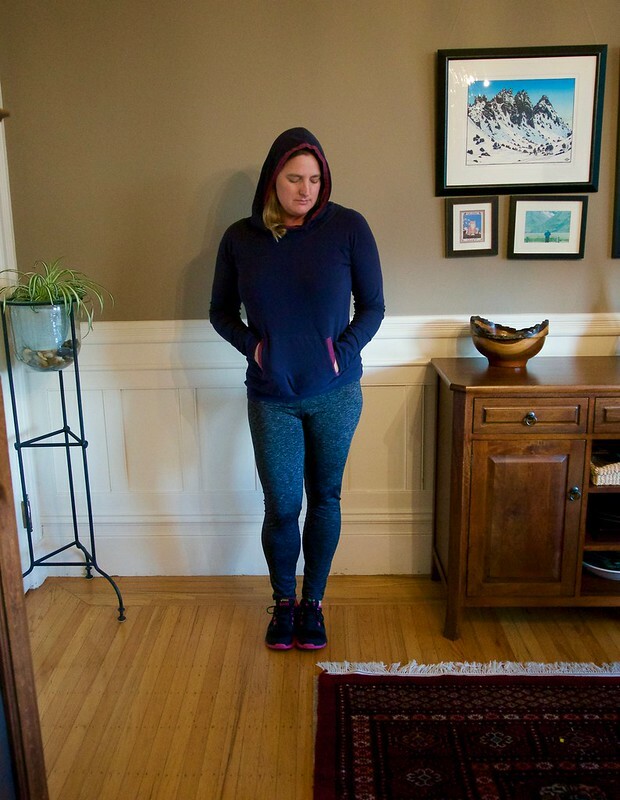 This fabric has been in my stash for quite some time – it’s a sport knit lycra that was always destined to become leggings. 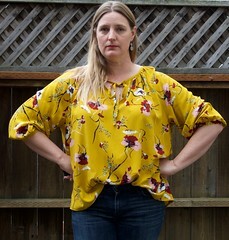 I love Hey June patterns, so choosing the Sloan pattern was a no brainer. 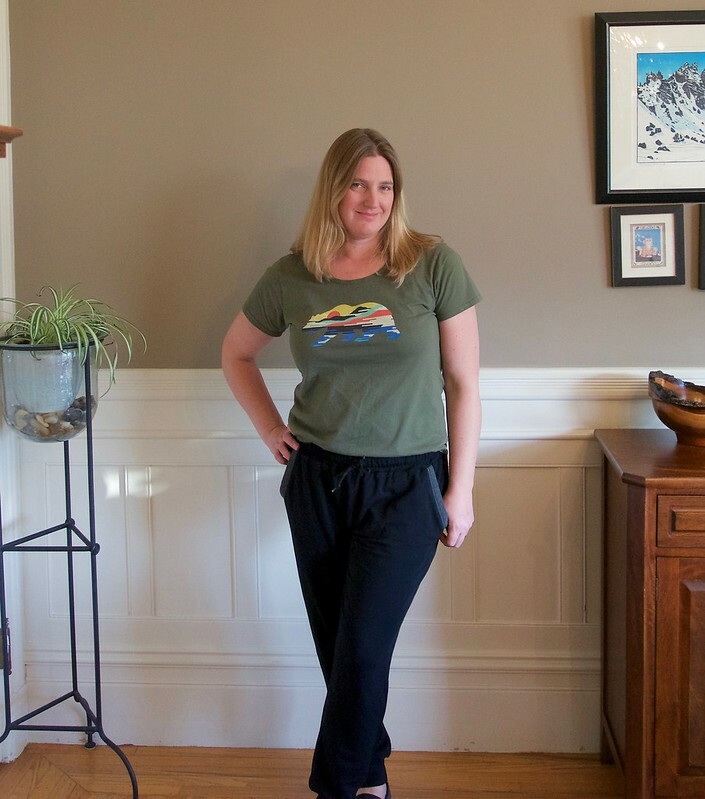 This is View A in the full length – and paired with my hacked (and never blogged) Lane Raglan hoodie. They were a quick and easy sew, made entirely on my serger. They turned out a little bit long even though I made the ‘regular’ inseam version, so I ended up taking an inch off the bottom. I think I could have gone down a size because they are a tiny bit looser than I usually like for workout gear, but still totally wearable. I like that they have a hidden pocket in the waistband. 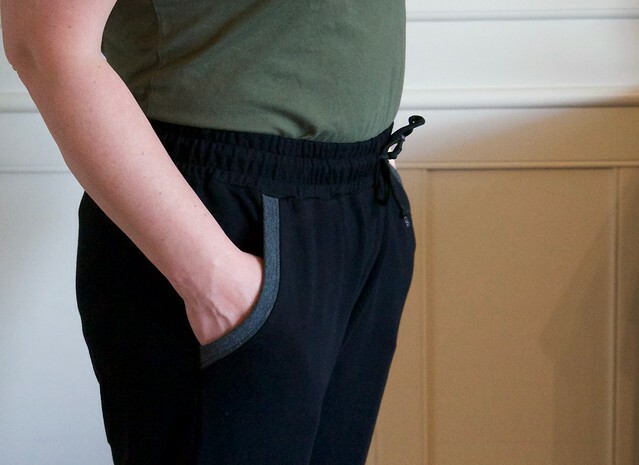 I added clear elastic to the waistband as suggested to help keep them up, but then I ironed it and I think I just melted that elastic and stretched it all out…oops…so no ironing that stuff next time!! I also think that I could use regular elastic, which I find easier to work with. If I can find the right fabric, I’d love to use this pattern to make a pair of long underwear type leggings to wear under ski pants. You must be able to buy capilene somewhere, right? 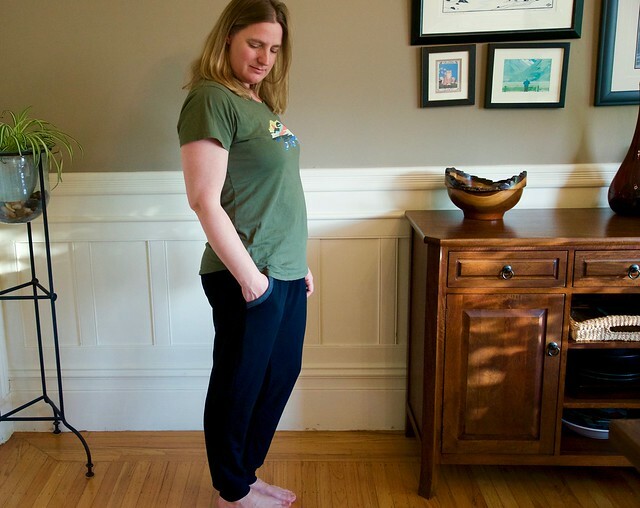 Helen’s Closet recently released the Avery leggings pattern – and it got me wondering if I need that pattern too! I mean, what if the Avery is better? Or just different? But I’ve already put the work into printing and taping and tracing the Sloan pattern, not to mention making a ‘wearable muslin’! Should I add a crotch gusset to the Sloan’s or use a pattern that has that built into the design? 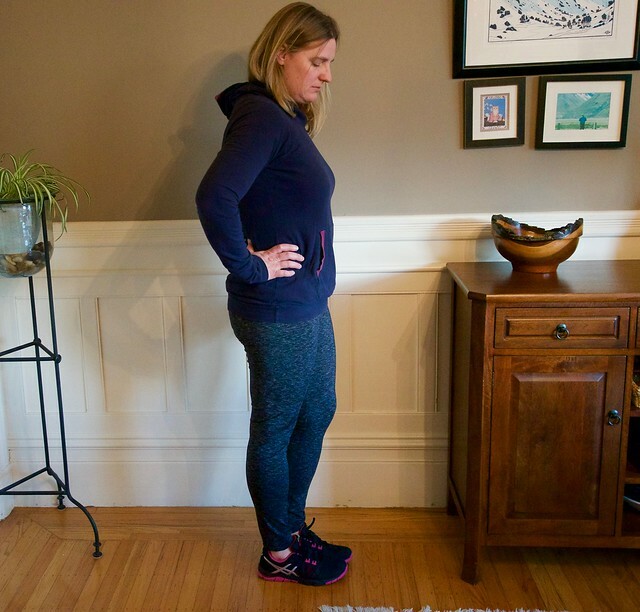 One thing I know for sure, there are some cool Avery’s popping up out there in all sorts of fun colors providing ample legging inspiration, no matter what pattern you choose. 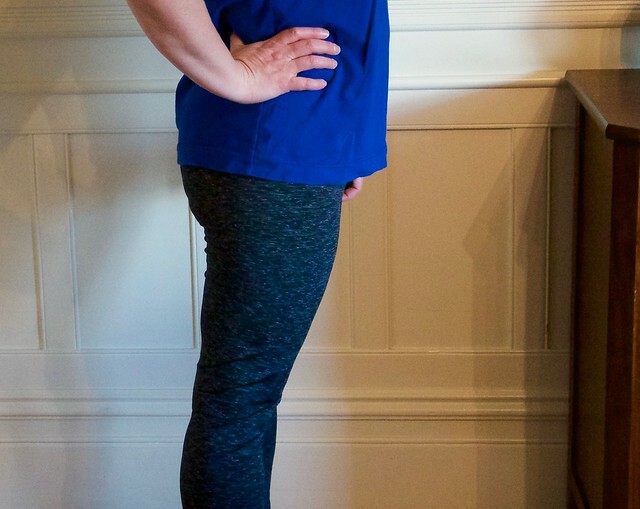 How about a pair of bright blue leggings (like Leslie made)? Or some amazing neon coral ones! Lounging in my Super Comfy Hudson’s! 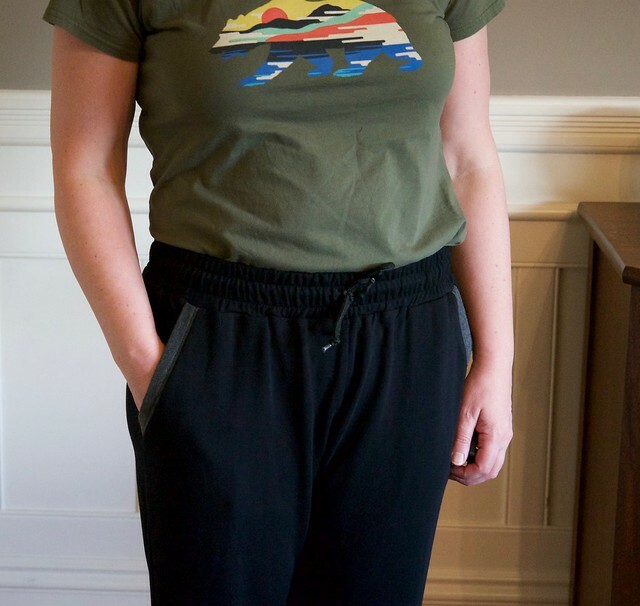 mmm…is there anything better than a super soft and slouchy pair of Hudson pants? This is the second pair of Hudson’s I’ve made – the first were made from some plaid jersey and are decidedly pajamas – and I’ve wanted to make a pair that I could wear outside of the house ever since. 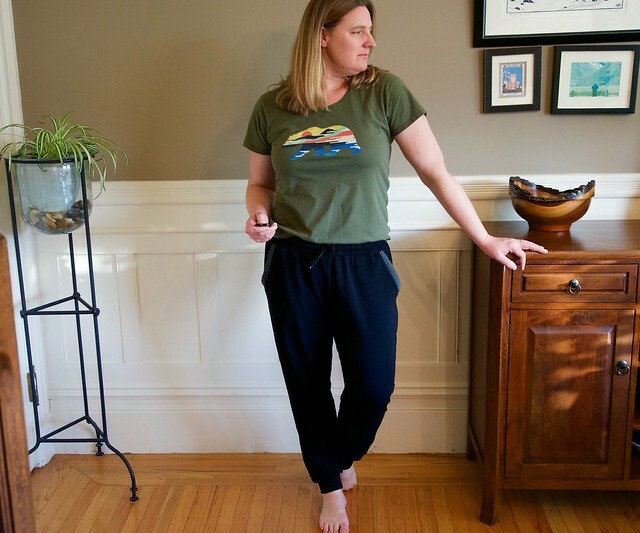 I found this luscious rayon-spandex french terry just before Christmas and knew they’d make a super comfy something…turns out it was the perfect fabric for the Hudson pattern! I used a scrap of charcoal jersey for the pocket accents and a drawstring from an old pair of sweats that I had in my stash. 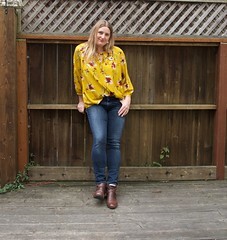 Click here to see all of my 2018 Make Nine posts!